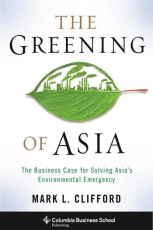 One of Asia's best-respected writers on business and economy, Hong Kong-based author Mark L. Clifford provides a behind-the-scenes look at what companies in China, India, Japan, Korea, the Philippines, South Korea, Singapore, and Thailand are doing to build businesses that will lessen the environmental impact of Asia's extraordinary economic growth. Dirty air, foul water, and hellishly overcrowded cities are threatening to choke the region's impressive prosperity. Recognizing a business opportunity in solving social problems, Asian businesses have developed innovative responses to the region's environmental crises. From solar and wind power technologies to green buildings, electric cars, water services, and sustainable tropical forestry, Asian corporations are upending old business models in their home countries and throughout the world. Companies have the money, the technology, and the people to act -- yet, as Clifford emphasizes, support from the government (in the form of more effective, market-friendly policies) and the engagement of civil society are crucial for a region-wide shift to greener business practices. Clifford paints detailed profiles of what some of these companies are doing and includes a unique appendix that encapsulates the environmental business practices of more than fifty companies mentioned in the book.